Looking for a prom party bus or transportation for your graduation party? Look no further, we provide bus rentals for your prom or grad at affordable prices. From budget minded school bus rentals to our luxury limo style coach buses, we’ll get you there in style! Find the bus that is right for your party. Check out photos of our limo style coach and school bus options here! • Lower Cost. Compared to limousine rentals, our school buses are a fraction of the cost. 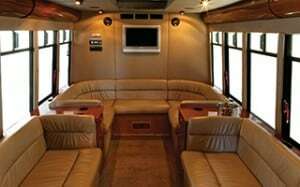 Our limo style coach party buses provide more passenger room and thus lower per passenger costs. • More Passengers. A party isn’t a party without your friends and the ride is a big part of your prom or grad night. Keep your group together – typically everyone fits on one of our buses! • Safety & Trust. We’re trusted by school districts and transit authorities to transport thousands of children and passengers daily. Our drivers receive safety training well beyond minimum industry standards. Our limo-style coach buses offer up all the fun you want. Bring in your favourite music playlist or your prom video collage to play on the bus! Our upscale coach buses have stereos and video screens to keep your party going. Air conditioning is also available on these buses. In all cases, hiring us to provide your prom or grad party transportation means you’re chartering the safest vehicles on the road, driven by our highly trained professional school bus and limo bus drivers. Further, our buses are maintained to achieve the highest standards of safety and reliability. Contact us for a FREE QUOTE for your prom or grad day transportation needs! Prom Party Buses in Your Area! Our coach party buses are available for prom or graduation bookings in areas throughout Southern Ontario, including; Greater Toronto, Mississauga, Brampton, Etobicoke, Markham, North York, Oakville, Burlington, Windsor-Essex County and surrounding areas. School buses are additionally available in Bradford and Simcoe County. For prom party bus availability in your area, please submit the online charter request form and we’ll quickly follow up with a quote!